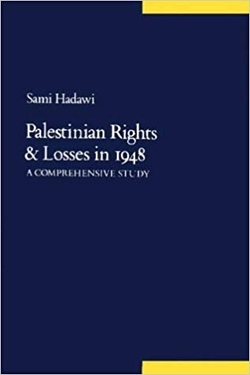 Hadawi and Kubursi have little to say about Palestinian rights, but they analyzes property loss in great detail. It would take an accountant years to verify their mountain of data, but anyone can judge for himself the results of Hadawi and Kubursi's effort. Converting the 1948 Palestine pound into 1984 dollars, adjusting, for inflation, and including what the authors call "human capital losses," the total indemnity owed Palestinian refugees is $147 billion. Given that some 600,000 Arabs fled Palestine in 1948-49, this comes out to a forfeiture of $245,000 per man, woman, and child — rather a high value for a poor agriculture country! In fact, this figure is wildly unrealistic. Moreover, it is meaningless, for the Arab exodus from Palestine was closely matched in numbers by a Jewish exodus from Arab countries. The Jews were mostly urbanites, so they undoubtedly experienced a higher per capita loss than the Palestinians — and where does this leave us? Maybe the Iraqis, Yemenis, and Egyptians who profited from the fleeing Jewish population should directly recompense the Palestinians? Or, since these lack so many billions, the oil-rich states should hand over virtually their entire savings? Instead, let's call the whole thing off.